I walked in the kitchen one recent morning only to be confronted by three bananas on the counter quickly approaching end of life. It was one of those rare weekend mornings when a supply of overripe bananas intersected with having the time to make banana bread. I’ve always used a very straightforward banana bread recipe that doesn’t have much spice, but I was in the mood for something a little different. King Arthur Flour has become a trusted resource for baking recipes and products, and I was happy to find a recipe on their website that could be adapted to use the Desert Creek Cinnamon Cream Honey I had purchased a few days earlier. 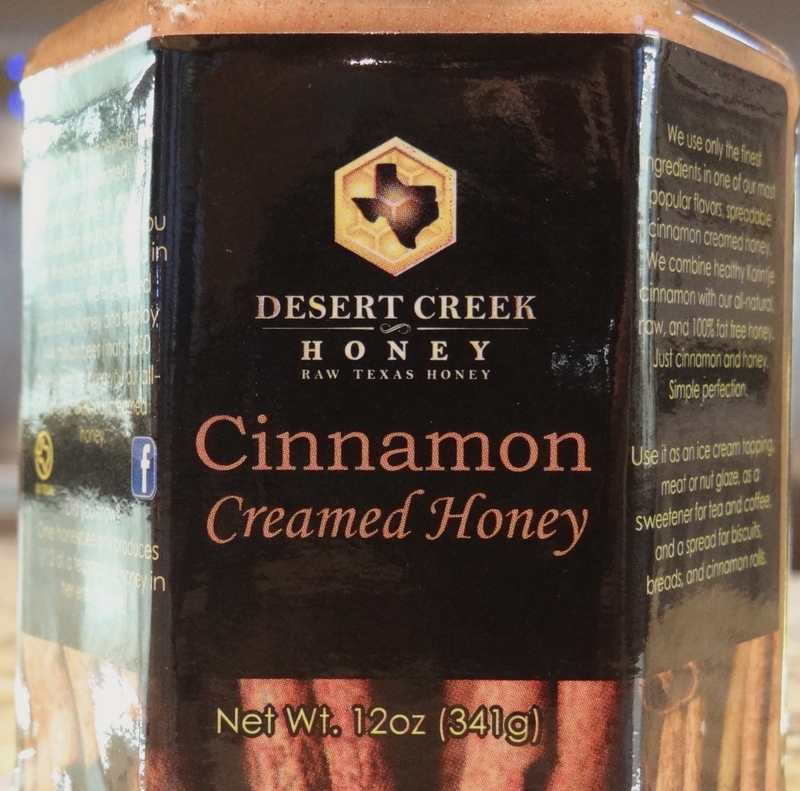 North Texas is home to Blake and Kathleen Shook’s Desert Creek Honey. What began as thirteen-year-old Blake’s hobby evolved into a commercial beekeeping enterprise with more than 72 million honeybees! The Shooks raise their own bees, harvest the honey and sell it directly to their customers. Blake is very active in beekeeping organizations, and supports beekeeping hobbyists. Desert Creek’s website has very interesting facts about honeybees and beekeeping. For instance, a honeybee produces only about 1/12 teaspoon of honey in its lifetime. Hence the need for 72 million bees at Desert Creek! I also learned the FDA has approved a specific honey for wound care. Who knew? Most importantly, Desert Creek offers liquid honey, creamed honey, pollen, comb honey, and beeswax for sale directly on their site. When I saw a banana bread recipe on King Arthur’s website that called for cinnamon and honey, my first thought was of Desert Creek Cinnamon Creamed Honey. This adaptation is a delicious, moist bread we will definitely be enjoying with coffee for the next few days — maybe with some additional Cinnamon Creamed Honey! Preheat oven to 325° and grease a 9″ x 5″ loaf pan. Combine butter, brown sugar, vanilla, cinnamon, nutmeg, baking soda, baking powder and salt in a large bowl, beating until smooth. Add the bananas, honey and eggs, again beating until smooth. Add the flour and pecans, stirring until just smooth. Spoon batter into prepared loaf pan, smooth the top, and let it rest at room temperature for 10 minutes before placing it in the oven. Bake the bread for 45 minutes, then place a piece of aluminum foil gently over the top of the pan to prevent over-browning. Bake for an additional 20-25 minutes, or until a toothpick or cake tester inserted into the center of the bread comes out clean. Allow the bread to cool in the pan for 10 minutes, then remove it from the pan and cool completely on a wire rack.